Anodized aluminum floor registers are resistant to corrosion and will stand the test of time. Metal air grilles that have been anodized are as beautiful as they are durable. The anodized aluminum floor registers have a matte silver appearance instead of an overly shiny look of polished metal. These metal air grilles have heavy cross bar reinforcement making them incredibly strong. Control your aluminum floor register with the dual control, multi-shutter valves. The shutter valves on the metal air grilles are adjusted with two smooth sliding tabs allowing you to control each side of the air flow. The damper of the aluminum floor registers is also made of aluminum so there is no need to worry about rusting. 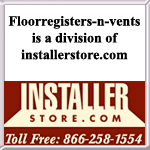 Tip: Metal air grilles for the floor are listed by the hole size they fit. If you have a hole in your floor that measures 6 x 12 you will need a 6 x 12 floor register. Find metal floor registers with additional color and finish options for every room in your home. Hart and Cooley aluminum floor registers can be shipped straight to your order. Order today!